A number of fanatic Israeli settlers attacked, on Friday evening, a young Palestinian man from Jerusalem, and attempted to strangle him to death, while working at the Rimonim Shalom Hotel, in west Jerusalem.His father said Mohammad was working when the settlers started insulting and cussing at him “for being an Arab,’ before one of them struck him with an iron bat, while the rest were beating on him and attempted to strangle him by wrapping a rope around his neck. The father added that some persons heard the screams of Mohammad in the eight floor, before hotel security rushed to the scene and managed to remove the assailants. The Police said it is investigating the assault, while Mohammad was asked to head to the police station after his discharge from the medical center. 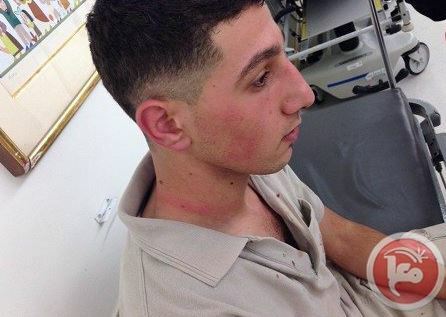 Earlier on Friday morning, a number of fanatic settlers attacked two young Palestinian men in occupied Jerusalem.